Nachi Fall in Nachikatsuura, Wakayama Prefecture, Japan, is one of the best known waterfalls in Japan. With a drop of 133 meters (and 13 meters wide). 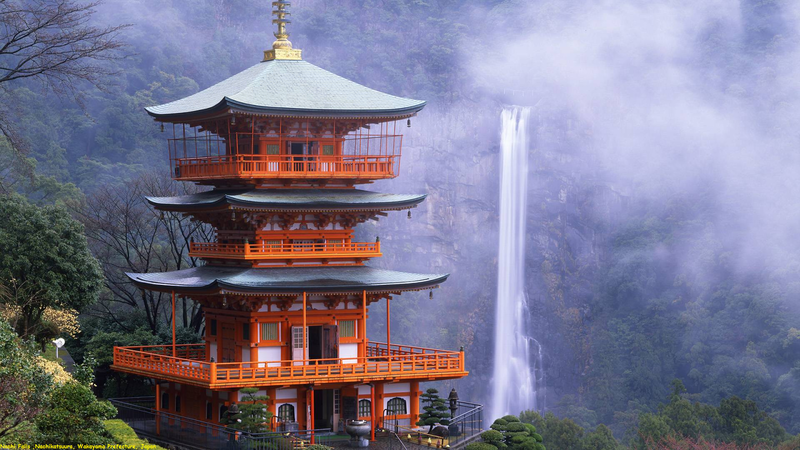 There are two rocks at the top of the falls that are the guardian kami of the falls and the Shinto shrine. There was also a Buddhist temple here that was destroyed during the Meiji Restoration (late 19th century). Many shugenja and star-crossed lovers have leaped from the top of the waterfall in the belief that they will be reborn into Kannon’s paradise.